The Secret Life of Pets marks the sixth film animation studio Illumination has spawned and it follows in the footstep of at least four of those (excluding the miserable Hop.) 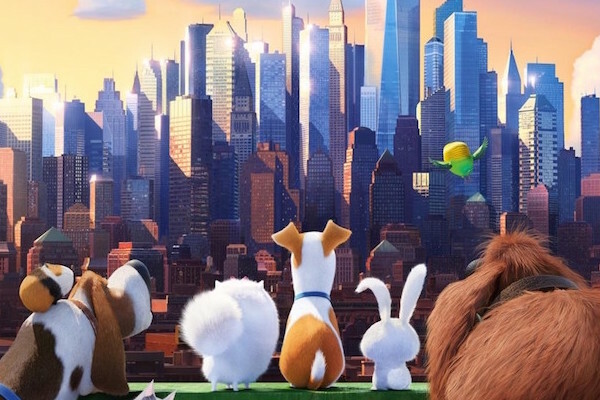 Like its predecessors, The Secret Life of Pets is a serviceable enough film with a few flashing moments of intrigue overwhelmed by mediocrity and profit hawking. It's the kind of film that references the studio's most popular franchise, Despicable Me, twice in less than an hour and a half. That followed a short film preceding the feature itself starring the company's breakout characters, the Minions. Illumination knows exactly where it's bread is buttered and how to appeal to a wide consumer base. Making a movie with any true artistic statement, however, seems to be a little outside of its wheelhouse. There's nothing overly wrong with The Secret Life of Pets. It's a cute enough idea with a few moments that capture the premise's adorableness aptly — most notably an end sequence set to Bill Withers' wonderful Lovely Day — and nice voice work from Jenny Slate, Lake Bell, Dana Carvey and a few glorious seconds of a menacing Al Brooks. Some of the jokes land well enough, most notably when the writers get a little macabre with their humor. It's a well-designed film, in as much as the design is to appease kids without actually challenging them in any meaningful way. Disney, Pixar and even (sometimes) DreamWorks have offered fair directed at children that has more depth, nuance and aesthetic pleasures than anything Illumination has cobbled together. And despite the animated format and the main appeal to a youth audience, viewers can and should expect better than the less than stellar tricks the film uses to tell its story. The Secret Life of Pets takes the proverbial easy way out from the very first frame that shows exterior photos of famous New York City landmarks set to Taylor Swift's Welcome to New York. A vehicular chase scene involving Brooklyn is scored to the Beastie Boys' No Sleep Till Brooklyn, whilst a fantasy sequence about friendship is coupled with Queen's You're My Best Friend. It's as if the multitude of filmmakers — the movie has two directors and three writers credited — are afraid of relying on a modicum of audience intuition. Illumination is a fearful studio, happy to offend in trivial, kid-friendly ways (this film has a fair amount of jokes about pooping and peeing) but not in a fashion that is daring or risky. The studio, and The Secret Life of Pets by default, is uninterested in being interesting, using the most generic building material possible to construct a nondescript house in the middle of suburbia. Nothing is memorable about this film except how unmemorable it is, a beige stain on a gray carpet. The metaphor serves as a description of the film’s overall messiness. The Secret Life of Pets covers at least three subplots: one an “Odd Couple” lite story between main dog Max (Louis C.K.) and new arrival Duke (Eric Stonestreet); one a rescue mission led by Slate's love-struck Gidget; and one a revenge tale centered on an annoying rabbit voiced by Kevin Hart) in less than 90 minutes. Attempting to cover so much in such little time grants little to no proper development of any of those three plots. The writers even shoehorned a pair of fantasy sequences in to fill time in a movie where a lack of time is a major flaw. Then there's the animation that, like Minions, The Lorax, and Hop before it, is never bad like Norm of the North, but is perpetually uninspired. That's vital for an animated film to create a world for the audience to get lost in, or at least replace the reality it eschews. Films like Zootopia and even the otherwise disappointing Finding Dory excel at fleshing out their fictional universes; The Secret Life of Pets has bothersome character designs and humans who always appear dopey in some capacity. The Secret Life of Pets is a success because it isn't built for excellence. The film will sell toys and apparel, promote impending Illumination products (like more Despicable Me films) and keep kids relatively quiet for a spell in the summer. Pet owners will be somewhat charmed by the premise and the snuggle sequence at the end, although adults will more than likely leave a little unimpressed with the totality of the experience. That still counts as a success for Illumination; after all, it's nearly impossible to fail when the standards are this low.